30 Apr The Earthquake in Nepal and why I want to help. This post is about the terrible earthquake in Nepal. It’s about what we are doing to try and help a little and also why we are throwing our weight behind this cause. Firstly let me go way back, way way back before I was born. Back in 1960 my father Chris Bonington climbed his first Himalayan peak, Annapurna II. At just under 8000m it was the first of 19 Himalayan Peaks. It was his first trip to Nepal, his first experience of this wonderful, chaotic, spiritual, exciting country. Back then a country where reputations could be earned and true adventure was at every turn, and very few westerners had been. On Dad’s first trip there things were very very different to the Kathmandu or even the Solu Khumbu valley (Everest Valley) of today. There was no airport, it was an overland trip from India…. and to get to India it was a cruise ship or Merchant vessel. Kathmandu only had one road leading into it.…. and get this, for those of you who have experienced Thamal and it’s hundreds and hundreds of guest houses, restaurants and hotels…. there was just one, the Hotel Royal owned by Boris Lisanovich, who is buried at the British Embassy cemetery. I didn’t get to travel to Kathmandu until I was 32 years old but my childhood was inexorably linked to Nepal and the Nepalese. In 1974 when I was 6 years old I met my first Nepali, a young surdar called Pertemba Sherpa or “PT” who was to become a life-long friend of my father’s and now mine. This amazing guy with classic Mongol looks of the Sherpa people, bronze of skin, short and stocky stature with heavily lidded eyes was visiting the UK to help my father plan the first ascent of the South West Face of Everest. PT would pick me up and carry me up High Pike (the fell behind my house) on his shoulders, whilst planning with dad about the logistics of their conquest. It is no surprise that Dad, and then I, would develop a deep love for the Nepalese people and their culture. 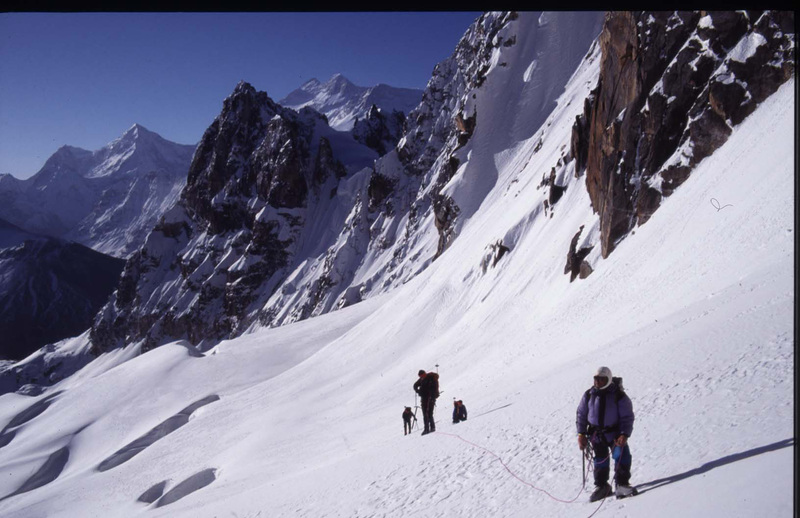 My first trip to Nepal was in 2000, where we made the first ascent of a small peak we named Danga II, in the Kanchenjunga region of Nepal. I immediately fell in love with the country and it’s people, even “crazy Kathmandu”. A lot of people find Kathmandu too much… it’s higgledy piggledy buildings, the piles of rubbish, the cows and dogs in the street, it’s thousands of people milling here and there. The hustlers of Thamal trying to sell you everything from Sandlewood carvings to fake Pashmina scarves to hashish. Kids grabbing your hand and trying to pull you this way and that and occasionally trying to lift your wallet as well and all with a good natured smile… it really really was the most amazing place. It’s like a complete sensory overload. If you look beyond the hustle, you see the depth and complexity of very old religious and structured societies. The architecture of the old parts of the city is astounding. The workmanship of the teak windows and beams. and the thousands of hand made bricks that go to make up traditional Newari architecture. As for the people of Nepal, the amazing warmth of them, their generosity, their kindness. I have travelled widely and I can’t think of any people that I have warmed to more. Every trek I lead, most people want to do their trek or peak and get home. Me, I love my family and love Australia where I live but Kathmandu revitalises me, I always book an extra 3 or 4 days after a trek to stay and catch up with old friends and wander around the Bazaars and Thamal and soak it all in. On Saturday 25th April, whilst I was having a few beers, and feeling pleased with myself as I counted my winnings from the day’s two-up games, my Nepal changed forever. I won’t go into too much details about the earthquake as this is very well documented. The death toll is in the 7000’s and rising and it has touched these shores with Australian nationals dying and also nationals from my home country of England. The earthquake was indiscriminate it has taken people from all walks of life but the majority were the poorest, the people living in the extremely poorly built and heavily congested areas or the extremely old parts of the city…. and still there are many, many missing. For me it’s been frantic Facebook messages, texts and Skypes and an overwhelming array of mixed feelings. So far all of our many friends both Nepali nationals and ex pats are safe. Most of the ones living in Kathmandu are camping in gardens and open spaces, as the aftershocks are making going back into your homes an uninviting prospect. Communication lines are extremely poor. This country that has had its limited resources sucked by years of civil unrest/war and government corruption. The infrastructure before the quake has been tenuous… now it is non-existent. Many of my friends are sherpa guides… were they safe? Were they on Everest or at Basecamp when the avalanche struck? Where was Pertemba Sherpa? Pertemba now in his sixties runs logistics for various expeditions, spends time up at Everest basecamp as well as his family home in Khumjung, now a sherpa heritage museum and the only traditional tibetan style house left in the valley, that hasn’t been modernised and turned into a tea house. How was Ang Phurba, the sherpa who stayed with my Dad at 7,800m at Camp 6 in 75? Where was young Khudam Tamang, a young very bright Sherpa guide who had accompanied me both on treks to Everest Basecamp and in the Annapurna region. How was his father Ram, a Surdar whom I had first met on my trip to Danga in 2000? How was Bikram Pandey and his family and staff? Bikram, the organizer of the Everest Marathon is Rams boss and has helped both my father and I with our various trip logistics for over 20 years. For the last few days I’ve had a pit in my stomach, a gnawing. Here I am on the insular peninsular of the Northern Beaches feeling impotent and unable to help friends. I want to lift blocks of rubble, hand out supplies, offer a reasurring hand, a shoulder to lean on. I am lucky all of “my” people are accounted for. The wonders of technology, over the last few days has meant that the disaster alert on the behemoth Facebook has meant most of them have signed in safe. My friends Ian Wall and his Nepali wife Sarita, got emails back to me. Pertemba’s grand daughter Rachana, who is a nurse in Melbourne contacted me to let me know her direct family were safe but they hadn’t contacted PT … but within a day or two news came, one of Dads oldest friends and a man I can remember from the blur of my early childhood was safe and had arrived back in Kathmandu. My joy of how “lucky” I am has quietened because yes my people are now all accounted for but they are there, living amongst the devastation, but what of their people, their neighbours, cousins and friends. All of them have lost in this disaster, all of them are affected, everybody knows someone who will not be coming back, all of them are still waiting on news of friends and loved ones. Many have lost their livelihoods. The Sherpas, the Rai and Tamangs and all the other people of the Himalaya have been carrying loads for Westerners for years. Well know its time for us to shoulder a load for them and for us to sweat for their benefit. What are the best resources I have to do some good? Well I have a gym….. I have friends…. I have time…..I have friends in charities that work in Nepal….. and I have passion…. and I have a cunning plan!!!!! So we are having a giant workout. I’ve made it easy and achievable by all, we’ve made a workout for kids, beginners and advanced. To join in, I’d like you to donate….. and if you can’t join in, I’d like you to donate as well. You must also register for what time you’d like to start (because of equipment and space we have 30 spots available each hour). We also have two Everest summiteers and adventurers Stephen Bock a local Real Estate Agent of Ray White Team Bock, and TV presenter Pete Wells, both of whom I trained for their successful Everest summit bids in 2010. Steve has been training with me in our Altitude chamber for his attempt at the North side of Everest in 2016. On Saturday Steve is going to see how long he can keep walking up hill with a heavy pack for, meanwhile Pete a keen paddler will be on a paddle erg, both at an altitude of 3500m roughly the height of Namche Bazaar, the Sherpa capital. It is just south of there that the Australian Himalayan Foundation built a school which has been totally levelled by the earthquake and we are hoping to be able to rebuild. The workouts and Stephen are going all day and we have set a target of $10,000. So there you have it. A little bit about my drivers… and about how you can help.